Some pieces of equipment become such an engrained part of your gear closet, a standard set piece in all your backpacking trips that they become easy to forget about. For me, the Enlightened equipment revelation pro Quilt is exactly that piece of equipment. I bought this quilt several years ago directly from Enlightened equipments website and haven’t thought about it since. It’s just always with me, summer, winter or fall this quilt is the base of my sleep system. It always works, always keeps me warm and is at the perfect weight to warmth ratio for me. On top of this it’s one of the lower priced high quality quilts on the market. I simply don’t think about this bag anymore, which in my view is the best compliment one can give a piece of gear. So much so that I haven’t even taken pictures of the bag in use in the wild. Sorry about that.. I will update this review later on with more proper pictures of it being used. It’s hard to complain about the weight on this quilt. A high quality down sleeping bag with a -6 Celsius rating or 20F. My specific bag is an L-long with x-wide around the shoulders with down 850 stuffing. All this puts the quilt at a total weight of 642grams on my scales. Full open blanket or buttoned down cocoon – you decide. The Revelation pro is highly adjustable and flexible for just about any trip. Granted I use it mainly as a cocoon strapped down and buttoned up on my sleeping mat. I guess it’s just the kind of temperatures that I normally hike in. Here in the mountainous regions of northern Sweden where I spend a lot of time, no matter the time of year you can always expect below zero – no matter the season. In other words it’s something you need to be prepared for. What I really like about this quilt is the comfort and ease of use. I love that I can button this down tight around my neck for when the temperature drops. I use this bag as my winter bag as well complementing with a synthetic quilt (38 Fahrenheit bag) on top and my Thermarest xTherm as a sleeping mat. This setup easily takes me down to -20 Fahrenheit with nothing more than just a overalls and thick socks on. The strap system is easy, light and effective. No brains required. The foot box buttoned tight. Can even be opened up completely and used as a blanket. Great for this summer nights. Not too big, not too small.. just right for a -6 degree bag. I always use a stuff sack and as you can see from the picture this bag when packed down will fit in most backpacks. I usually have it at the bottom of my backpack. The bag packed down and ready to go.. compared to a Jetboil.. because.. According to the price you would think the Revelation and Enlightened equipment as a company is just cheap Chinese rip-offs. But the truth is these bags are superior to just about any bag out there and they are handmade in the USA. These bags are priced perfectly in other words. Starting price for a custom made Revelation pro with 850 down filling x-long/x-wide cost me $300.00. Try finding a cheaper 20 degree, 650 gram, 850 fill down quilt for the same price. Perhaps a synthetic quilt. 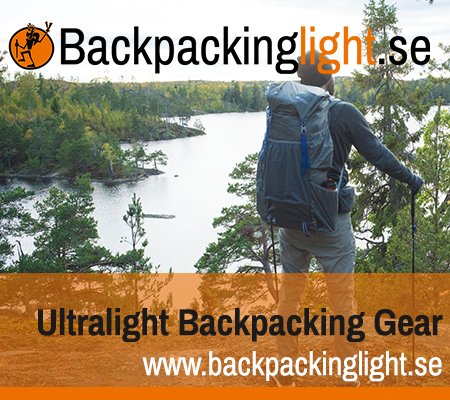 All the bags that Enlightened equipment has are perfectly priced. A 0 degree synthetic bag called the Prodigy will run around $180.00. I ordered one. My specific bag is rated at 20 degrees – or -6 Celsius. And it’s one of the few bags I’ve ever tried along with Western Mountaineering that I would say the temp rating is fairly spot on. I have had this quilt down to -5 celcius with just my long johns on and it kept me very warm and cozy. The only time this quilt fails is when the sleeping mat isn’t up to par with the outside temperature. This of course could be said about any and all bags and quilts. The sleeping mat is probably the single most important gear choice in the quest to keep warm. You will notice that I have a bag that is for 20 degrees. This is over kill for most summer hiking In most climates. But in Sweden I find it a necessity unless I’m in the woods. However, if I were to hike in parts in the USA in the summer than I would definitely go with a lighter, colder solution than the 20 degree quilt and xTherm sleeping mat. But as it stands the majority of my hiking is done in the mountainous northern regions of the planet where temperatures drop suddenly, snow is still all around in the middle of July and the wind rages on down the mountain sides. All orders are custom made, you decide colors, down (or synthetic fill), width and length. The orders usually take a week to process, sew and ship and so far I’ve never seen a slow down or bog down in production like many other small cottage firms. Enlightened equipment have several different models from the most minimal the enigma, the Revelation pro, the convert, accomplice, prodigy synthetic to even hammock over and under quilts. I will be honest here, I bought the enlightened equipment revelation pro because I couldn’t quite convince myself that I needed to buy a Katabatic gear quilt for $500, same weight and temp rating. I can’t compare the two as I’ve never owned a Katabatic quilt. I can say that I probably won’t own one either, or any other bag for that matter simply because I’m not convinced there is a better bag on the market. I’ve owned and used many different quilt and bags before I bought the Revelation pro, that was over two years ago and I haven’t needed any other bag since. To give an idea of how much faith I have in Enlightened equipment as a quality gear producer I recently bought a custom made (all their quilts are custom made) prodigy synthetic quilt as a winter overbag to my quilt. They even sell a double bag strap for this specific use as well as a nice little guide to how bags are stacked and what temp rating it will give you. Maybe one day when my Enlightened equipment revelation breaks down, burns up or is stolen (or if given to me by some stroke of mad genius by a PR department.. hint hint) I will try a different quilt or sleeping bag, and perhaps a different company altogether. But as it stands, enlightened equipment simply has the best bags for the money available and I see no reason to change a working formula. Is there anything I would change? Probably not, maybe if I could choose a 950 down fill for the same price.. but now I’m just getting greedy. Having owned a Katabatic and Enlightened quilt I will say that EE can improve on the snap closure (mine tore), and neck closer. Overall top quilts, but Katabatic kit is a notch higher IMO. I also think the Hammock Gear Burrow offers a rival to EE. But I would recommend EE highly and good after sales service as they stand by their products. Thanks for the comment here. I feel my GAS coming on when your talking about the Katabatic kit 🙂 Sometime I will have to try these other quilts out. I’m 6’3″ and fairly wide at my shoulders. sorry about the confusion.. you are I are about the same size (length wise..) I have the Long/x-wide version and find it to fit me just right. Is ultralight right for you?